Charlottesville Virginia – Check It Out! When one makes a trip to spend a few days in an area you have never visited and discovers it’s an attractive area, sometimes it turns in to a “Let’s move here” idea. I could see how that could happen in Charlottesville Virgina after spending 3 days there this week. We just wanted a getaway and picked Charlottesville off the map. Having never been there, we did a little research and found it’s a good place to visit and to live. Day one we flew to Richmond Va and took our rental car for an easy drive over to Charlottesville via I-64. Takes a little over an hour with stop an a visitors center on the way. Seeing one of the big attractions is visit to Thomas Jefferson home (Monticello) we exited I-64 and followed the signs. We first came upon historic Michie Tavern cir 1784 which offered a buffet lunch which we were about ready for and then a tour of the tavern by ladies in period dress. We went ahead and got the Presidential tour package which includes Monticello, Michie Tavern, James Monroe home and James Madison’s home at Montpelier. After eating we took the Michie Tavern tour with a nice lady as guide. This got us in the right frame of mind for the next stop. So about 2pm we arrvied at Monticello which is right up the road from Michie Tavern. This is a popular place and lots of people were coming in from the parking lots. We stopped by the ticket office and immediately got on the bus for the next tour of the home. The bus takes you up to the top of the hill to Monticello. Their is a guided tour of several rooms of the home and it has a lot of the items owned by Mr. Jefferson and other period pieces to look just like it did when he lived there. Thomas Jefferson worked on Monticello for 30 years and made it his unique home. Afterwards we joined a tour of the grounds and made a day of it. I think Monticello was the highlight of our trip. Day two we take the short drive down to the University of Virginia to find the Rotunda designed by Thomas Jefferson. We park at The Corner, a popular place for students, and just follow them up the hill, over looking grounds framed by historic buildings. 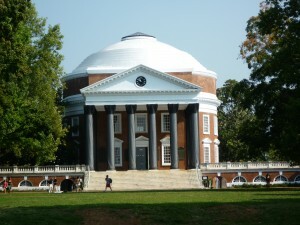 Every hour there is a tour by a student guide starting at the Rotunda. 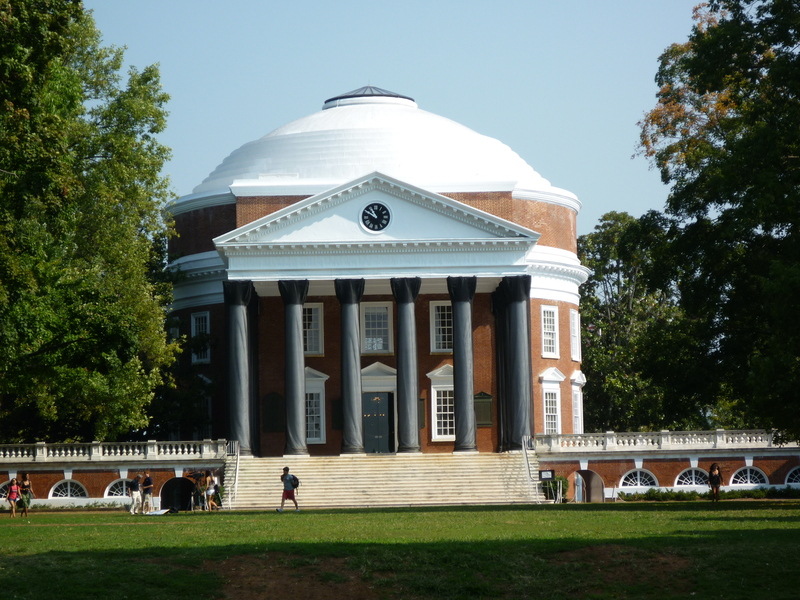 We visited several rooms inside the Rotunda and hear about it’s amazing history, then go out in to the academic village for more of the tour. After wards we stop by a student hangout at The Corner for a coke. Next it’s a short drive to the downtown mall, which is an area several blocks long with the main street closed to auto traffic. Side walk cafes all around and we try on out for a delicious lunch. For the afternoon, we drive out to tour the farm of James Monroe which was part of the Presidential homes ticket. Day three we drive out to Montpelier James Madison’s huge home and farm. It is a about 15 miles north of Charlottesville, right off the path to the Blue Ridge Parkway, which we would be visiting that afternoon. We pass many farms on the way. This property has been restored by the National Trust, and they have done an excellent first class job. There is a large visitors center where we watch a short movie about James Monroe, the father of the US Constitution. Next we tour the large home and walk the grounds. It getting around noon so we head East to the Shenandoah Park. Ticket is $15 but since I am 62, I am offered the Senior Pass for $10 and it is good the rest of your life. What a deal! We get on the Blue Ridge Parkway and about 9 miles along stop at the Big Meadows Lodge for a nice lunch in their dining room. We enjoyed he views and head back to Charlottesville where we dine that evening at the Boat House, the best new restaurant of the year. It was an amazing trip and to see so many things in such a short period of time! Charlottesville is a college town with history and everything you would want, without the traffic of a large city. If you have never visited Charlottesville you need to. You just might want to move there.